XFX F-35 is a high-quality 35 mode filter in the VCV Rack format. The filter algorithms feature optimized 4x windowed sinc oversampling for pristine quality drive and true cutoff slope at high frequencies. The algorithms are also Zero Delay Feedback for accurate cutoff frequency and equal resonance across the spectrum. All of this quality still remains CPU efficient with careful optimization and heavy use of SIMD to process the two channels in parallel. 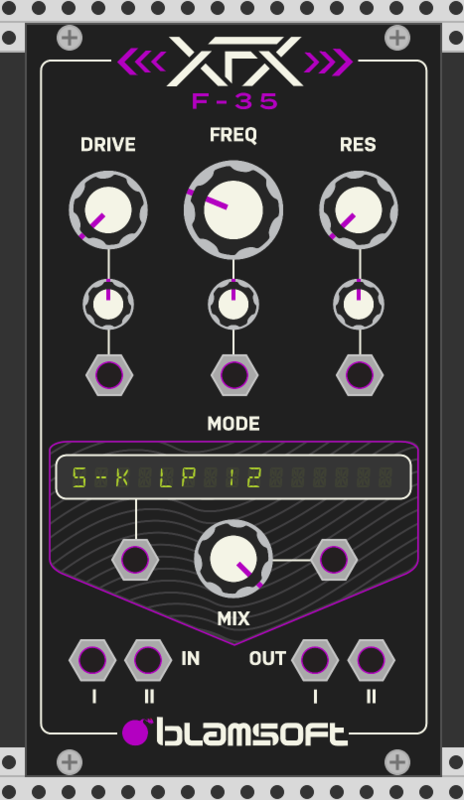 You get tons of modes to explore and patch points for every parameter for endless tweaking. The cutoff frequency range is 20 Hz to 20 kHz. XFX F-35 is a module that can be downloaded for free in VCV Rack’s Plugin Manager.